Bill and I took an amazingly beautiful hike today at Starvation Creek State Park, located in Oregon, just west of Hood River. One of the trails we hiked was called “starvation creek” because it was said that a train was stopped there by snow drifts, and passengers had to dig out the train. No one actually starved there. The passengers were kept from starvation by men who packed supplies in from Hood River on skis. 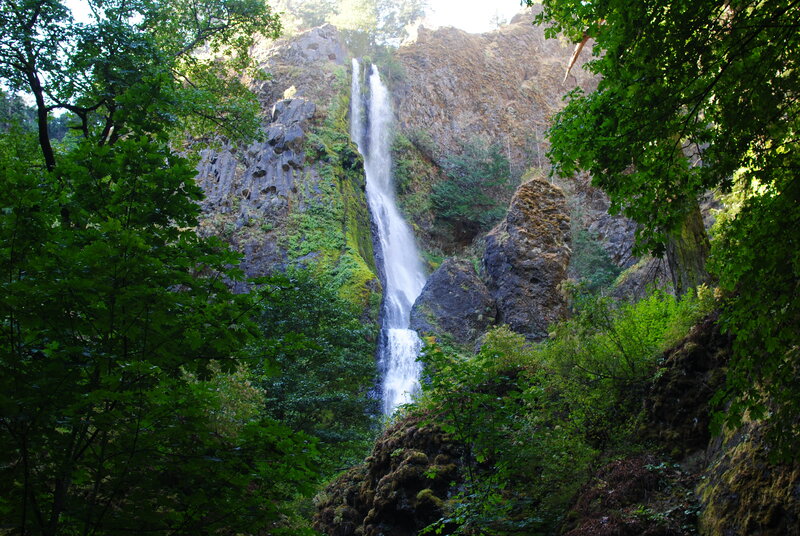 There are several amazing waterfalls in the area. 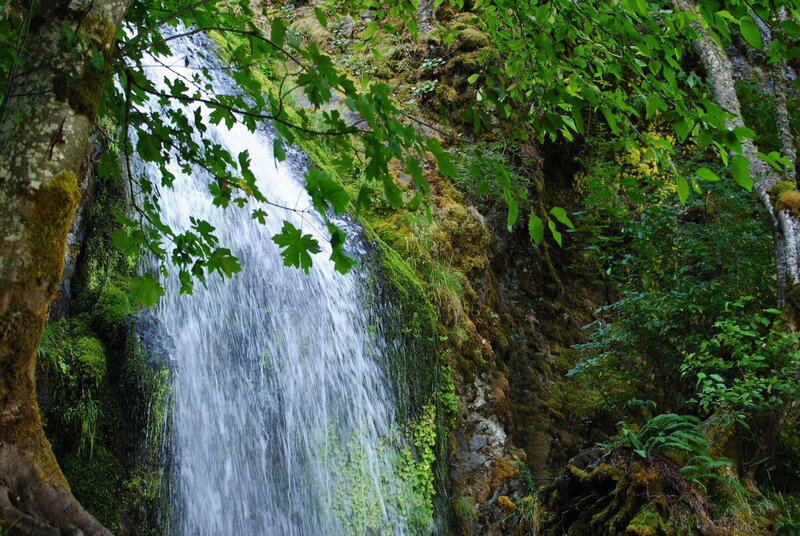 The first waterfall we saw was coming down from the top of a mountain, in a beautiful water cascade, that flowed down to a small creek at the bottom of the mountain. Huge, green trees, all around the area, made for lots of shade, and a beautiful picture. The second waterfall we saw wasn’t as big, and I didn’t notice anything strange about it, until I got home, and started looking at the pictures I took. That’s when I noticed what looks to me, to be the image of a face of a man inside the waterfall. Don’t know if my sighted readers can see it, but Bill said he does. The man’s face is towards the top of where the waterfall begins. I can see two eyes, a nose, a mouth, and one ear. If you look closely, you can also see what looks to Bill and I like a snake that wraps around the man’s head just in front of the man’s ear, going over his forehead, and over the other side of the man’s head. The snake looks like it has its mouth open… This was early morning and no, we were not drinking…Ha! When we got to this next waterfall, the water was coming down so fast and hard, we could feel the mist spraying out over the surrounding rocks and trees. It felt wonderful just to stand there and let the cool mist spray over us too. It was a lovely hike, with stunning views. Like this view I captured looking down from halfway up the mountain trail we were on. 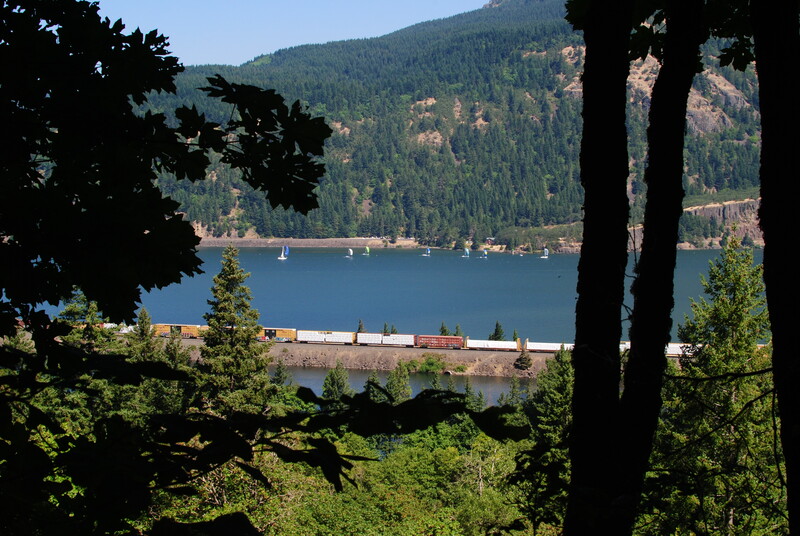 The 24/7 train that runs by our campground is in the foreground, and there were lots of sailboats, with colorful sails, out enjoying the waters of the Columbia River Gorge. 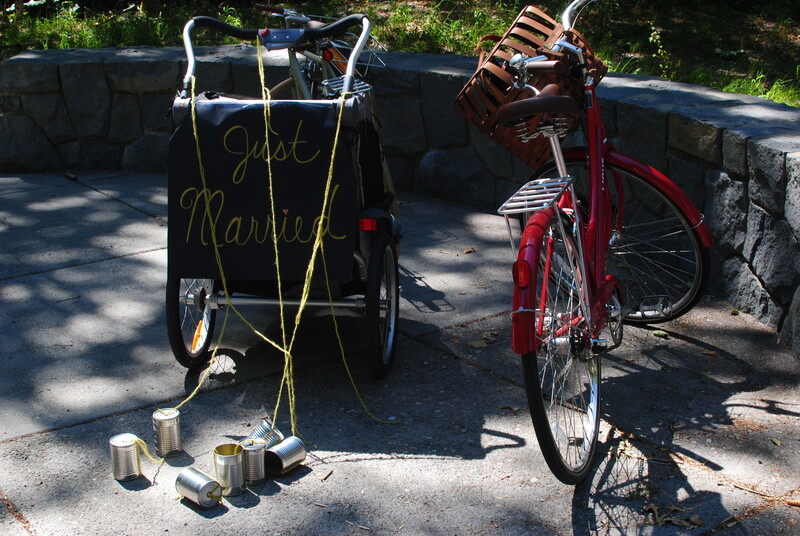 As we made our way down to the beginning of the trailhead, we saw the “bikes” the bride and groom rode in on… How adorable is this three wheel bike with a sign on the back that reads “just married” complete with the traditional tin cans tied to the back of it? What a fun time exploring! I do see the man with the snake on his head, although I wouldn’t have caught it just looking at the pictures. You pay attention much more than I do! The pictures are so beautiful and I loved reading about the bride and groom. Although I don’t post a comment all the time, I sure am enjoying your posts and living vicariously through you and Bill and your adventures! Stay safe. Love you. Great images frissy! Well done! 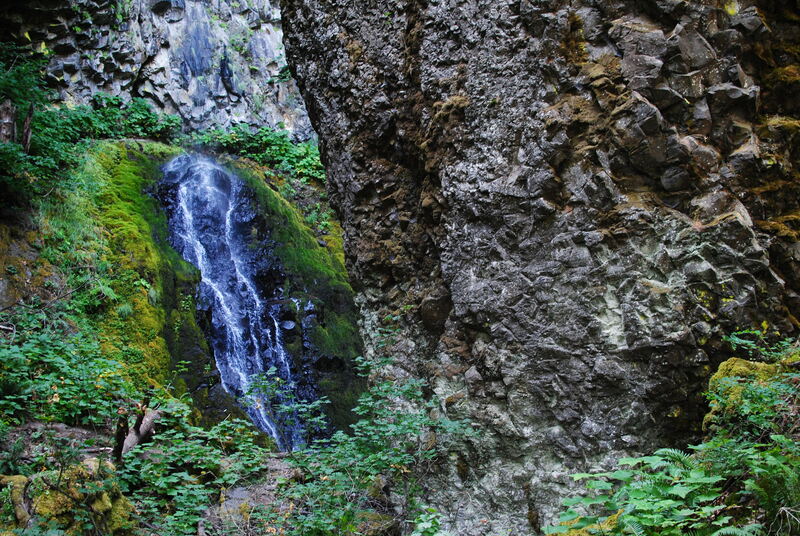 What a beautiful area…Oregon is mind blowing and you’re doing a fabulous job sharing why!! Love you! Thank God for all the beauty we have seen so far as we travel through Oregon. The hike was fun and the images of the falls were kind of eerie, you are correct we didn’t have anything to drink then, but after the hike,was a different story.